I must have had IKEA meatballs twice or three times before deciding that I could not have any more. For some reason, they always tasted bland yet overly salty at the same time and the gravy had that overly flour-y taste. I remember liking the lingonberry jelly, though, perhaps because it counteracted the saltiness of the meatballs. But I guess the Platonic ideal of IKEA meatballs stayed with me, because when I saw these beauties on Heather's blog, I was in love. I knew I had to make them. These meatballs were perfect to serve to a large group of hungry folks. I started with about 7 pounds of meat (5 of beef and 2 of pork) and mixed it up with onions, breadcrumbs and 3 eggs. For the "gravy," it was a simple béchamel sauce seasoned with a lot of nutmeg. I served these with buttered boiled potatoes. The meatballs were even quite spectacular with plain ol' white rice. Pardon the pictures: I had to take this the next day so there would be natural light. The potatoes and the gravy didn't take too kindly to reheating. Looks-wise, that is. They still tasted great! Mix all of the ingredients in a ball. Form into 1" balls. Fry until done. Alternatively, you can also bake in the oven at 425 degrees F for approximately 30 minutes until done. Melt butter in saucepan. Whisk in the flour until just lightly golden. Slowly add the milk, whisking as you go, to prevent lumps from forming. Season with salt and pepper. Add nutmeg. Peel potatoes. Put them in a pot and cover with water. Wait for the water to boil and turn heat to low. When potatoes are fork-tender, drain. 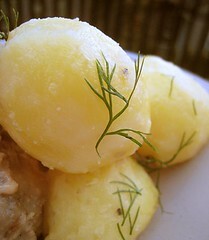 Toss with 4 tbsp of butter and season with salt and pepper. Sprinkle with dill. 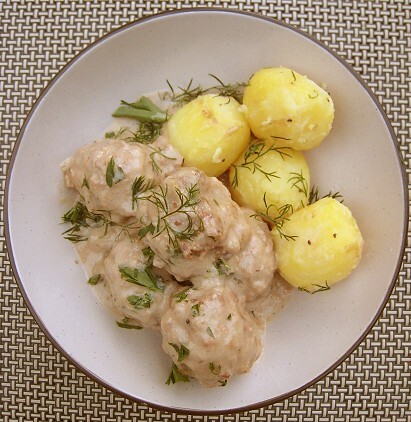 Ladle "gravy" over meatballs and serve alongside the potatoes. Indeed, these are beauties and I do recall Heather's...good eye! Oooh... like you, I order swedish meatballs from IKEA but it doesn't always hit the spot. I'll have to try this because your version looks way more appetizing!! I used to make Swedish meatballs all the time in college. They were my go-to dish. I'll have to give them a try again! Ah, the food of my people! Always a popular dish for us around the holidays. 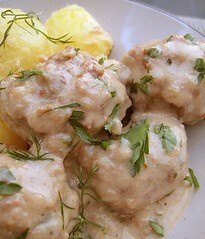 I love swedish meatball and yours looks amazing! We were missing the lingonberry jam, I think! Thanks! We have to make these again soon. You can definitely adjust the salt in your own version. The IKEA ones are soooo salty! This was very popular with the kiddies! Thanks! This was the first time we tried making it ourselves.